We can start making forward progress again. 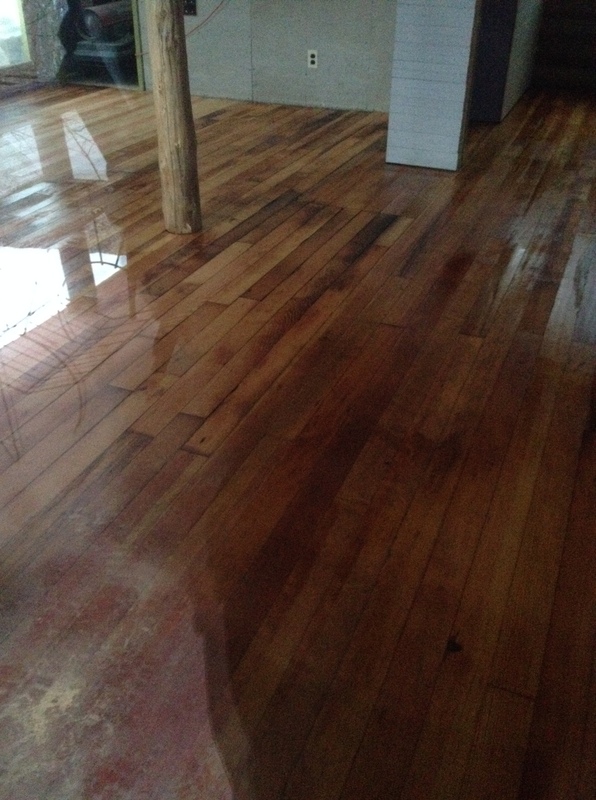 Plus the weather, though obnoxiously cool and wet, is at least good enough to finish a number of the jobs we had hoped to do prior to the floor debacle. Since floors are now on hold, back to those jobs. 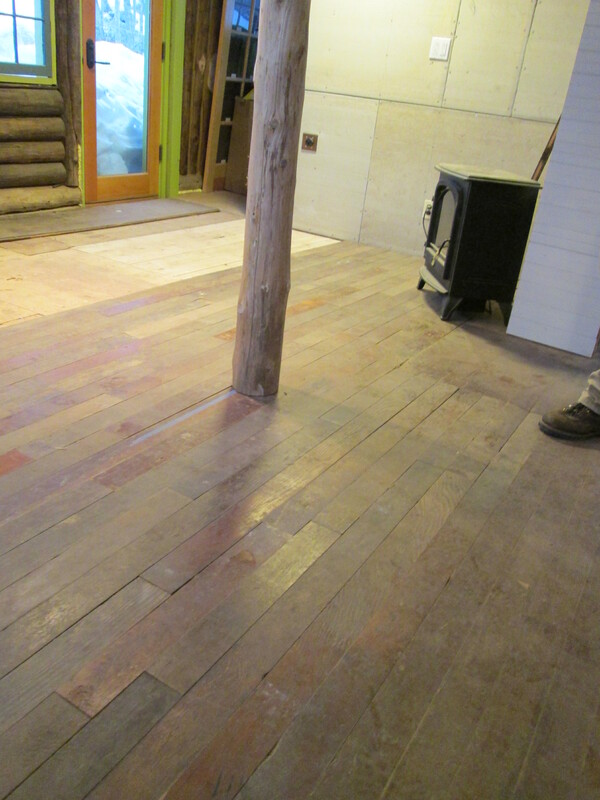 First, we have to give a shout-out to Ron at Hammond Lumber (we usually don’t name names, but he has been AWESOME! ), who spent more time than it was worth tracking down tiny little brackets we needed to do a non-standard window install. 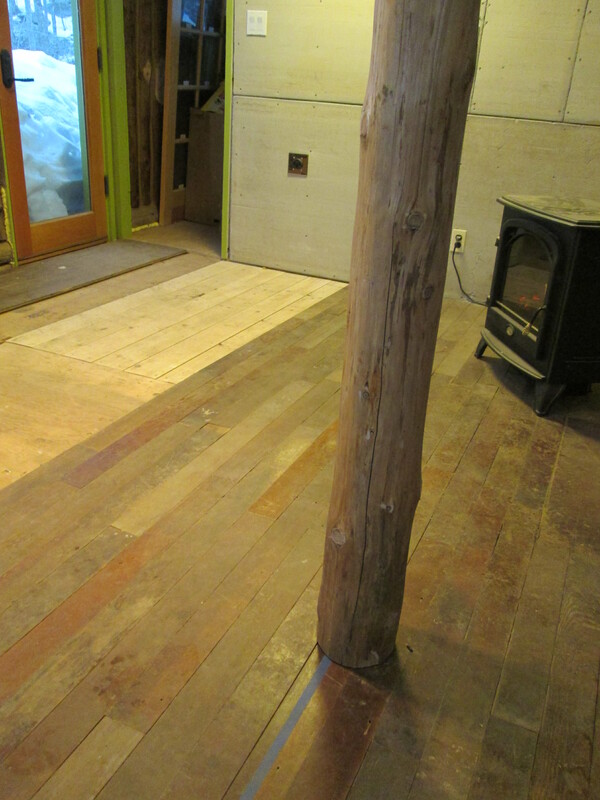 Our new closet window (the nicest one in the house – but a floor model) needed special brackets to mount it in our logs. We ordered them from our good, local builders supply store – and the manufacturer shipped the wrong parts! So no window that week. Then it took Ron a couple more weeks to find the right ones and get them in – in the meantime, he managed to find part of what we needed locally, and was so helpful and kept us in the loop the whole time, even though our entire order totaled – get this – less than $11. Makes us remember that there IS still good customer service out there, despite what happened with the floor. We needed that. So the final window went in this weekend! It’s amazing. 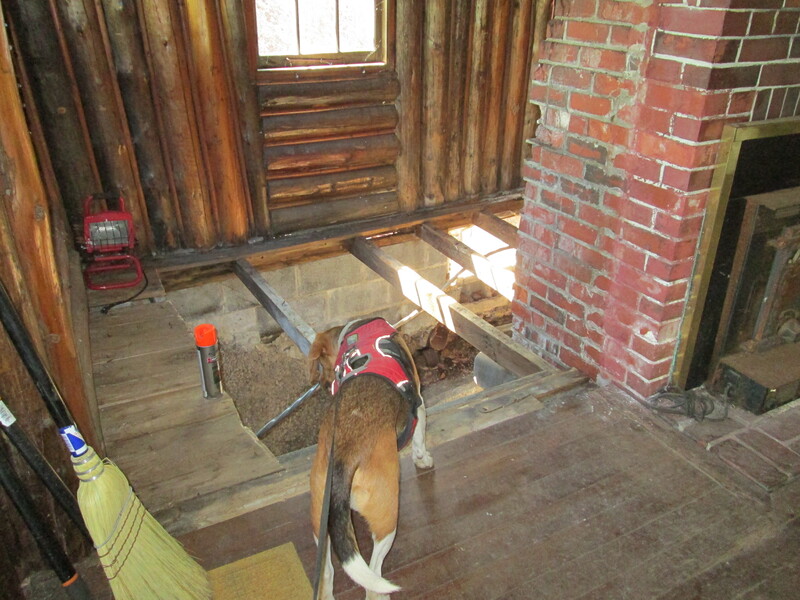 It was a floor model – top muntins are different than bottom. But hey – it’s in a closet! With the snow gone, you can even see the window from outside! Foamed around windows and peeled off the tags/film. Nice view! Caulked and painted all the beadboard walls. So much smoother looking and crisp. And more to come soon. (We did plant a couple of small trees, etc.) On a bit of a roll. It was nice to get our hands dirty. Not the floors, the contractor. There were some issues and it was time to cut our losses. 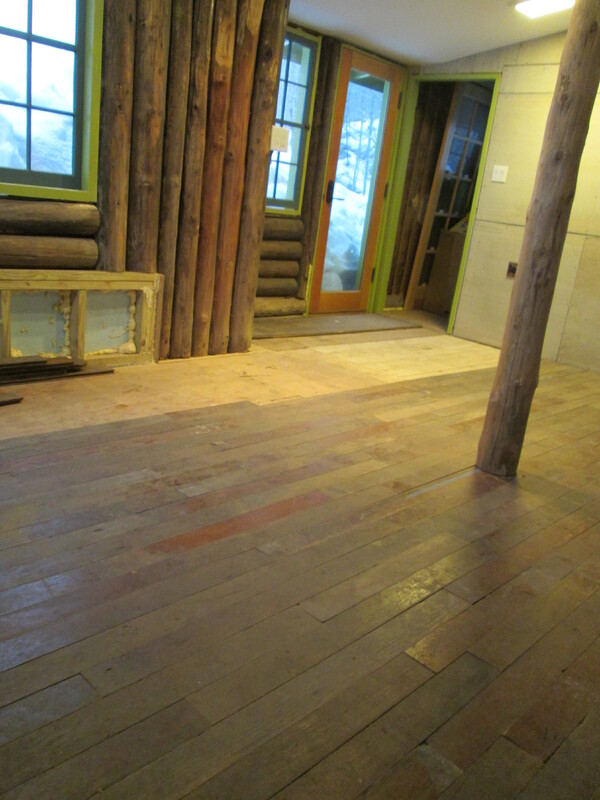 Stay tuned – we have a plan and things will turn out fine, but you won’t see any floor posts for a bit. When we are in a position to have them repaired and redone, we’ll post some lovely photos. Until then, we get to get back to work ourselves, finishing the last window, caulking the interior logs, and finishing up drywall and backsplashes. 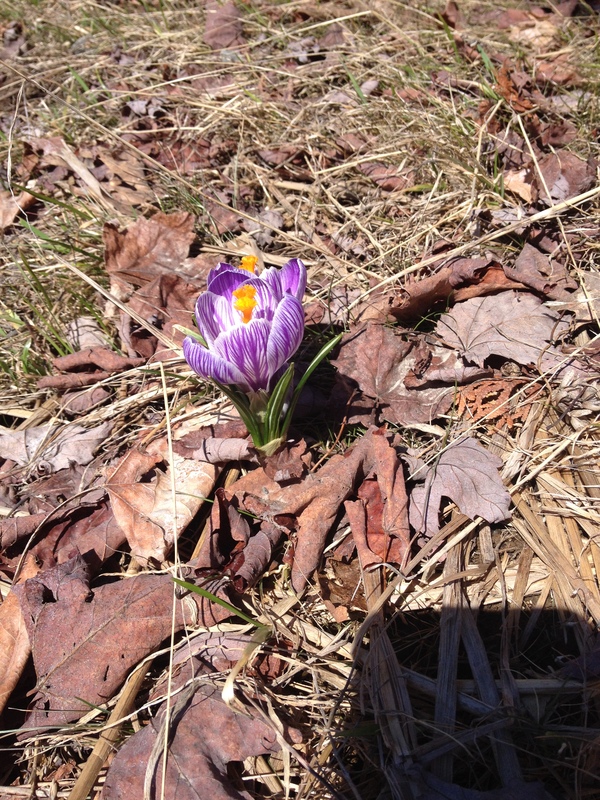 Great news is, the snow is gone and the crocuses we planted last fall came up! Spring has finally sprung. They are looking really good! Our horoscope said this week would be crazy – and it was – but things are looking up now. 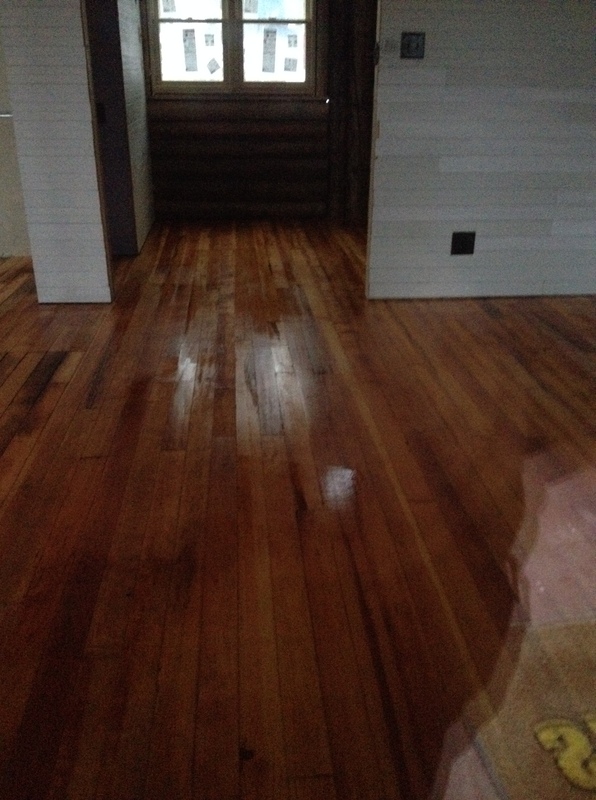 Here’s our sneak peak (photos through the door glass) at flooring after patching, sanding, and a coat of sealer. Poly goes down this weekend, and we can put this one behind us. Man, did this brighten the place up! 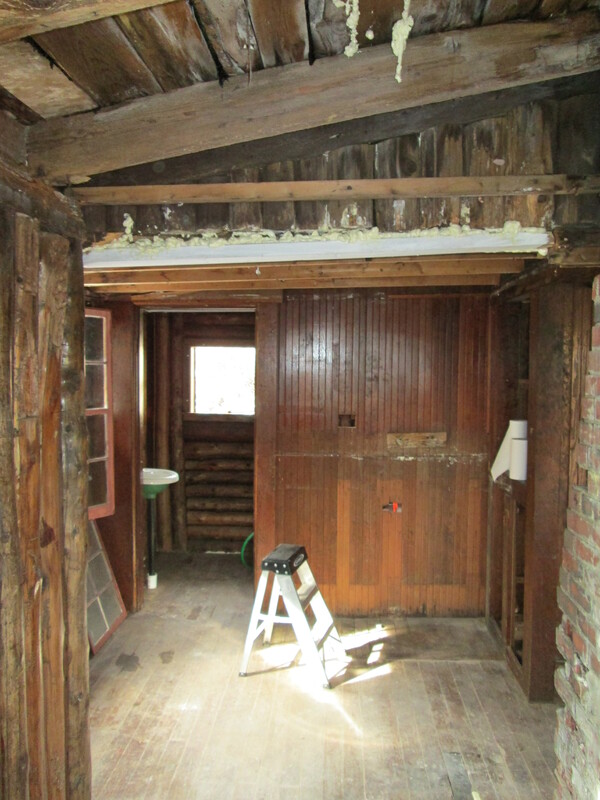 It (almost) looks like a house now, eh? No more shack. OK, I am back from umpteen work trips this month (the most recent involving a redeye flight, which I had previously sworn off – and will now swear off again. Hard to get going again!). Get going we did, though. Because the floor refinishing crew was arriving this morning. Here’s the story of today, which was nuts. 1. Drop off K at work at 7 am. Dog is in the car with me, because it’s daycare day (they don’t open till 7:30). 2. Get gas, then stop for rock salt on the way to camp since it freaking SNOWED yesterday and was icy on Saturday when we went to finally clean out for the flooring project. 3. Run up to camp, turn on heat, hope the guys are late, fumble around since all the dog hitching places are gone due to total cleanout for the floor crew. One-handed now (leash in other hand), spread salt and sand on the steps. 4. Meet they guys (they were awesome), discuss the insanity of 16 degree temperatures in April, and the issue of floor finish not curing in the cold. Troubleshoot a little; give the tour of electrical systems, places to patch, etc. Freak out a bit due to cold issue. Tell crew I realize they will probably be swearing at us by day’s end for having a difficult site (happens every time). They were great about it! Left them a gallon of water for emergencies (oh yeah guys, sorry there’s no running water OR good heat – just space heaters!). 5. Run back to the car, book it to doggie daycare. 6. Coffee re-fill! Then to about 8 meetings and classes in a row. 7. Get in touch with local building supply store to figure out why the heck the window company sent us the wrong parts last week (!) which meant that we couldn’t install the last window before the floor crew was to arrive! Argh! 8. Get a call from the flooring project manager (miss call by 2 seconds). Play phone tag a while. 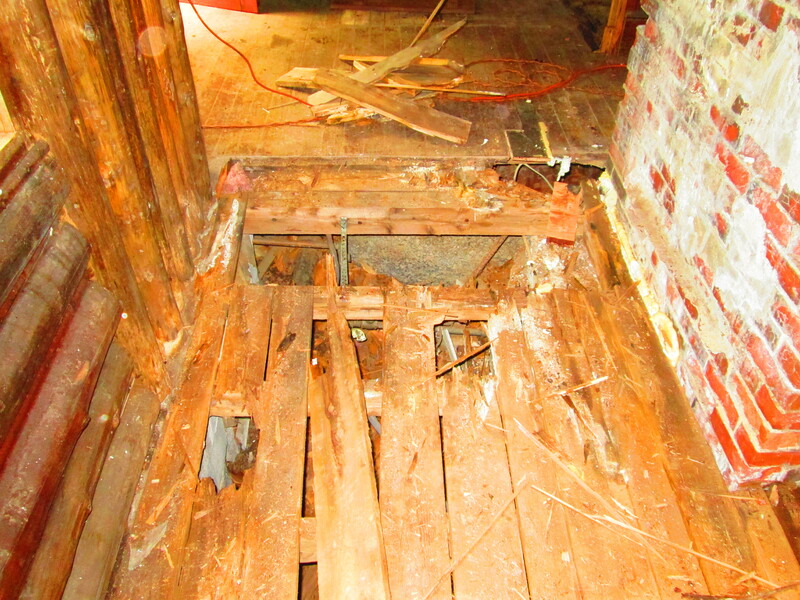 Finally get through and discuss issues with (1) not enough salvaged wood – we’re now on the hunt for more, and (2) the heat! – not enough of that either. The plan: we’ll wait to finish up until the weather changes. Soon, please!!! 9. Then pick up dog, K, and go back to camp to see what happened. (12 hours later). Dinner at some point? 10. Umm, it looks awesome. Even with just part of the patching done. Totally worth the chaos and drama. However, may tomorrow be a simpler day. 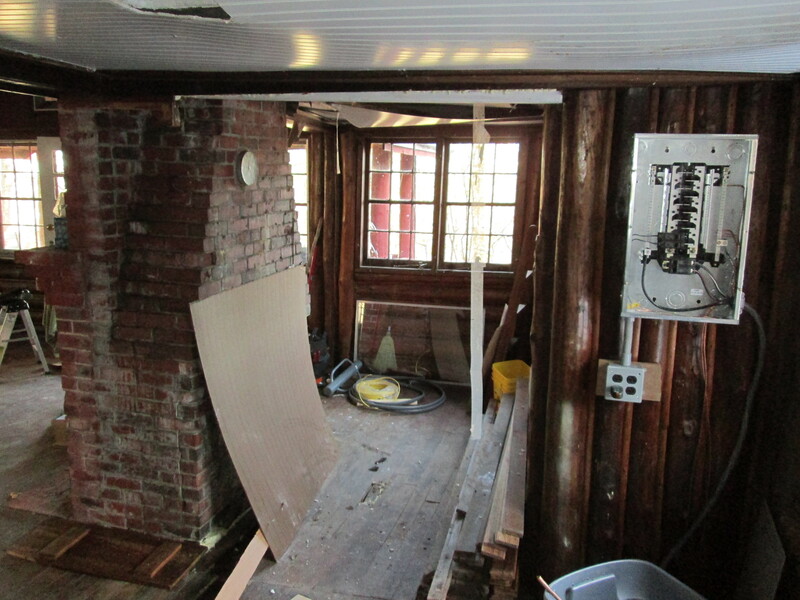 And here are some really gnarly before-ish pictures to remind us that we are actually making progress!